Whether you’re an occasional or frequent user of public transit, there’s always that one thing that is the driving force of the bus or train that you ride on (well, unless you’re on a automated subway line, cause that’s a computer system controlled by a centralized command center). If you haven’t guessed already, it’s your transit operator! These operators spend countless hours behind the controls of a bus or train, transporting thousands if not millions of passengers each year. Unlike those of you, like me, who have driven a personal vehicle, operating a transit bus or passenger railcar is much harder than it seems. First, these operators have to have the necessary licenses, certifications, and training to operate these vehicles. Obtaining a commercial driver’s license alone is no easy task from what I hear. Then you have other certifications that might be required, not to mention weeks of training. 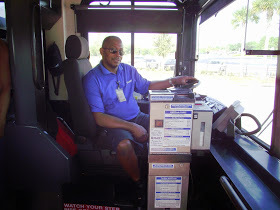 Many transit agencies require new hires to undergo eight weeks of training, if not more, before being able to operate the vehicle on their own. Then there’s the tasks of dealing with tight spaces and turns (for a bus), filling out inspection reports, keeping on schedule, and following safety procedures. Bus operators also have to deal with seeing customers face to face and validate fares. Rail operators tend to not have as much face to face contact with customers, but they’re still here to help! To make a long story short, these operators sometimes don’t receive as much appreciation as they should. When you board a bus or train today, please tell your operator “Thank You”. Even a simple smile and wave will show the operator that you care! Because these operators do a lot for us, we should be be appreciative for all they do.